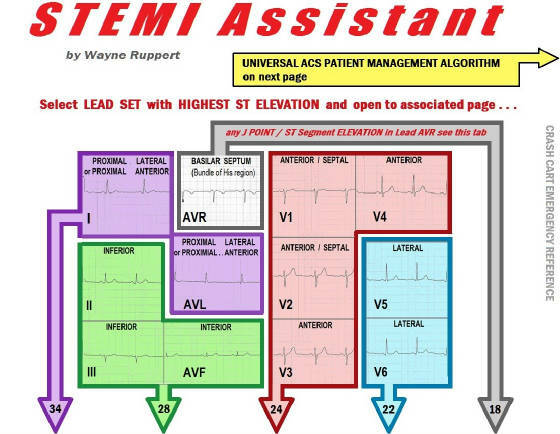 STEMI Assistant is a condensed 42 page reference manual for health care practitioners who care for patients experiencing acute ST Segment Elevation Myocardial Infarction (STEMI). STEMI Assistant presents the latest evidence-based practices described in the American College of Cardiology (ACC) / American Heart Association (AHA) 2013 STEMI Guidelines, AHA/ACC 2014 Non-ST Elevation (NSTE)-ACS Guidelines and evidence based practices described in 19 additional recent scientific journal articles. ACS Risk Stratification is presented, and features the HEART Score. This section of the book was edited by Barbra Backus, MD, PhD, the physician and research specialist who developed the HEART Score.